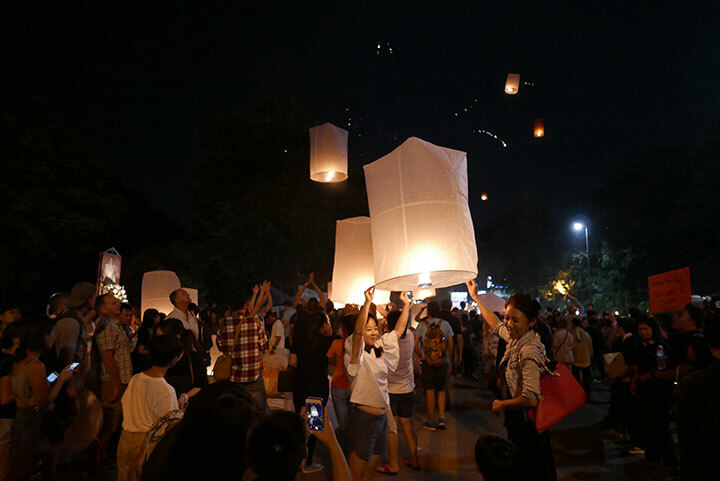 We were lucky to be in Thailand during one of their main festivals and also being in Chiang Mai was a bonus as it’s kind of the epicentre of the Loi Kratong festival. Now, I’m not exactly sure what the festival is all about. 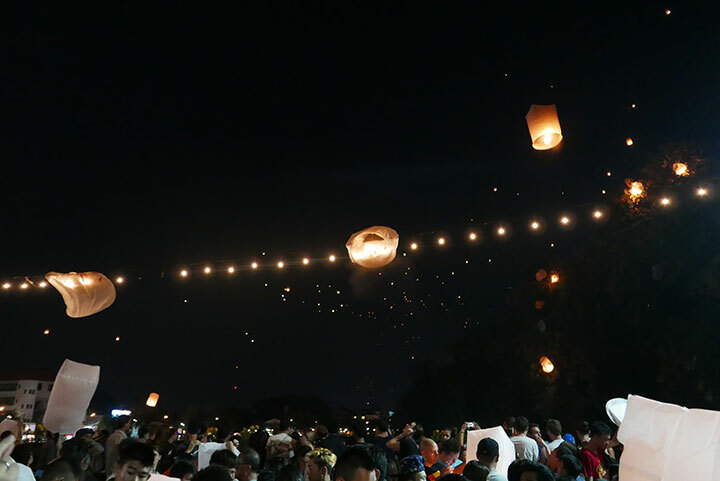 I’ve heard it is to celebrate the Thai New Year, celebrate the 12th moon of the year and generally cast away your sins as you cast burning lanterns into the sky, so excuse me a minute whilst I do a quick google…. It's because the main rice harvest season has ended so its time to thank the Water Goddess for the abundance of water and apologise for polluting it. 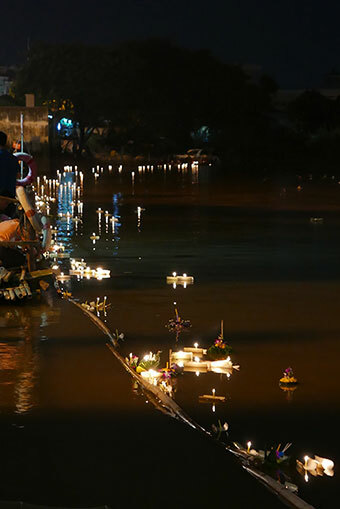 If your candle stays alight until your Krathong disappears out of sight, it means a year of good luck. As usual we hadn’t particularly planned what to do and after the SEO Conference finished we just went for a bit of a walk down to the river from the Le Meridien hotel. As luck has it this was where all the activity was happening and thousands of locals and farangs descend onto the Iron Bridge and Warrorot Bridge en masse to let off lanterns into the sky. Firstly, I have to say that it’s a pretty awesome sight, but one thing you don’t often hear about is that most people have never lit a lantern before in their life and are completely clueless about what they’re doing. Multiply this by a few thousand all lighting lanterns in a tight space next to each other and you can guess what kind of pandemonium is going on…. There were lanterns caught in the trees, stuck to the rafters in houses surprisingly not doing any significant damage, well at least we didn’t see any! The most worrying thing however, was the number of lanterns that people lit which weren’t properly heated up, so instead of flying off peacefully into the night, cleansing you of your sins through the year, they would just descend rapidly onto someones head, causing mass panic and mild burns to the unsuspecting victims. Apart from that there were people everywhere, surrounded by cars, some crazy people driving mopeds through the crowds and the occasional lantern just decided to fall out of the sky and hit you on the head. My personal highlight was seeing the lanterns which had rockets attached to them… of course the rockets were pointing down towards the ground… genius! It was all pretty spectacular to watch though and I enjoyed the full moon and sky full of glowing lights, but it was also nice to retreat to a safe distance for a bit as well and enjoy a cold beer without fear of immanent combustion! The second day of the festival was a little more serene, although the crowds weren’t much thinner than the night before. The focus of Saturday night was a parade from the old City to the River, which featured a variety of floats with costumes, dance and music from Lanna, Thai and other Asian countries. The lantern show was a little less bonkers than the night before but was still fun to watch the craziness, which contrasted well with the serenity of Thai families adding floating offerings of flowers, incense and candles which they added to the moat around the old town, I believe as another way of cleansing. Overall the festival was pretty cool to witness. I think I’d recommend trying to find a spot near the river, on the banks ideally, where you can watch things go by without placing your life in imminent danger!! !